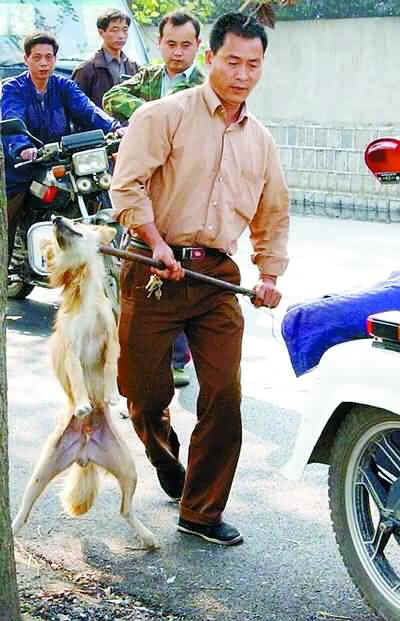 The world is aware of your sadistic and brutal treatment of dogs and we will not tolerate it. In fact there is an ongoing Boycott of all goods from China that will end only when China learns to treat the dog, with the respect due to him, as the wonderful friend that he is. consistent neither with learning nor true civility. While most people know that dogs are eaten in China, that does not begin to describe the cruely in this gruesome industry. Superstition, ignorance and a primitive, backward mindset prescribe inflicting extreme pain on the dog prior to slaughter to enhance the quality of the meat. There are legal, government regulated slaughterhouses which result in the tortured deaths of 16 million dogs/year, but the number is quite possibly tenfold, as the slaughter goes on in restaurants and private homes daily throughout China. The 'dog of the day' on the menu in restaurants in Beijing is the St Bernard. Twenty thousand dogs were purchased by China to be used as breeding stock for this lucrative status symbol. Using this definition, you can draw your own conclusions about whether China is a modern, civilized nation."